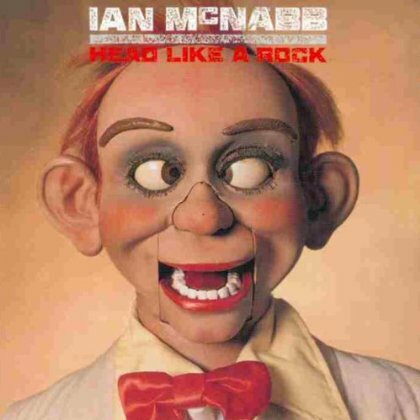 Discussions Magazine Music Blog: IAN McNABB/Head Like A Rock (Deluxe Expanded 2CD Edition): Available February 5, 2013! IAN McNABB/Head Like A Rock (Deluxe Expanded 2CD Edition): Available February 5, 2013! Ian McNabb is one of the UK's finest singer/songwriters. From his amazing releases in the '80s with The Icicle Works to his inspiring solo work in the '90s and beyond, McNabb has not released anything resembling a bad record. While Oasis, Blur and The La's may have garnered all the praise in the days of Britpop, Ian McNabb was making records that were better and far more consistent than those made by his commercially-accepted contemporaries. One of those albums, Head Like A Rock, is receiving the deluxe treatment from Cherry Red, which is pretty awesome. There's a remastered version of the album plus a bonus CD that contains 9 bonus tracks. Read the sell sheet info below and get yourself caught up. Its McNabb time! After the Icicle works split up Ian went solo and signed for Andrew Lauders This Way Up Label after releasing the well-received Truth and Beauty McNabb was allegedly inspired to a rockier sound by the engineer who mastered that record, telling him "Aye, Ian, your rocking days are behind you." Legend has it that McNabb went back to his home in Liverpool, and recorded a demo of what would become the coruscating opener of Head Like a Rock, "Fire inside My Soul". Label boss Andrew Lauder then suggested that McNabb go to record in America, which McNabb was sceptical about. He facetiously suggested to Lauder that his new material sounded like Neil Young and Crazy Horse, and if Lauder could get Crazy Horse to play on the record, he would go to America. A few phone calls later, McNabb found himself in a Los Angeles studio with Crazy Horse drummer Ralph Molina and bassist Billy Talbot. This cast-iron rhythm section appeared on four of the ten tracks on Head like a Rock, including the No. 54 UK hit "You Must Be Prepared to Dream". The album's other single, "Go into the Light", did not feature Crazy Horse and peaked at UK No. 66. Head like a Rock was subsequently nominated for the 1994 Mercury Music Prize, and although M People would end up taking the award home, the attendant publicity surrounding the award-nominated album propelled Head like a Rock into the UK album charts, where it peaked at No. 29.